Biology Department faculty and the graduate students they supervise are affiliated with several of the campus's interdisciplinary graduate programs. The links below provide information about those programs and their students. 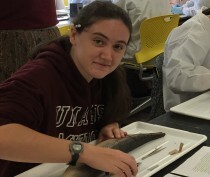 The Biology Department is associated with four interdisciplinary graduate programs, each of which focuses on a different area of biological inquiry. A directory of all grad students supervised by Biology Department faculty members.